30 years of medals in the United States! Founded and owned by a veteran. Quality Satisfaction Guarantee: Its simple. You don't like it? We offer our moneyback guarantee! 30 years of satisfied customers! If there is something you don't see that you would like to, contact us through through our seller profile and let us know how we can improve! A Bite-with-your-teeth Solid Metal Medallion! 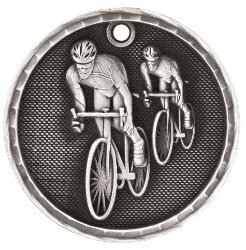 The perfect Bike award medal for youth or adults, Bike triathlon, or any other Bike event! Comes with a free ribbon! Upgrade to a specialty ribbon that matches your team or customize it to make it personalized! Engraving, and medal display cases available! Customize Now! If you have any questions about this product by Trophy Crunch, contact us by completing and submitting the form below. If you are looking for a specif part number, please include it with your message.